OK let’s assume in this example that Morgana manufacturing company produces tables. Product cost, all product cost can be categorized into three subgroups, direct material DM, direct labor DL, manufacturing / factory overhead, I use both the terms because some text books use factory overhead, and some text books use manufacturing overhead. 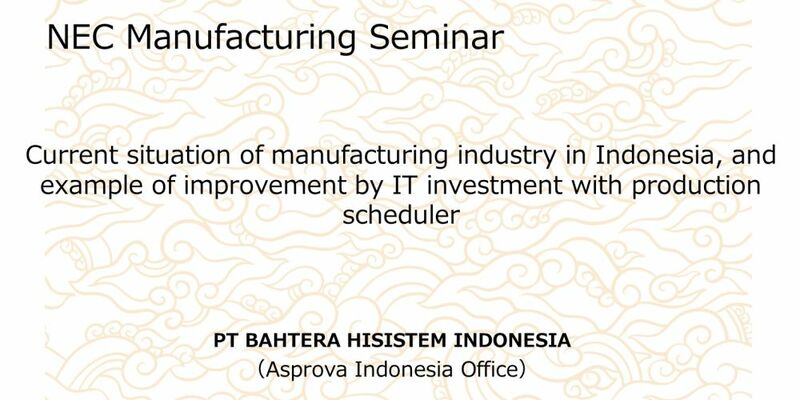 So if you see the abbreviation FOH that’s factory overhead, if you see the abbreviation MOH as manufacturing overhead, they both mean the same thing just depends on what book you are using. Lets talk a little bit more in detail about each of these components of a product cost. Direct materials there are a couple of items here that I have tried to highlight in terms of what makes up or what are the features or what are the qualities of direct materials, traceable to products. So direct material can be directly traced to a cost object, in this case a table that were manufacturing. Direct material makes up a significant quantity of the final product, the table that were manufacturing. A direct material, the value of direct material that is used is quite high in relation to the value of the final product cost. An example of a direct material would be wood, so wood would be the main component for instance in this table that Morgana ｍanufacturing company is producing. Next we will look at the direct labor component and direct labor also follows the same pattern that is the direct labor can be directly traced to the product manufacturing the table. The direct labor is in significant quantities of the product, and the direct labor value is relatively (相対的に) high in relation to the final product cost. An example of a direct labor would be carpenters wages, so you have carpenters that are actually producing these tables and all their wages would be normally classified as direct labor. Next we will get into (入る) the third component which oftentimes students find a little more confusing, that’s your manufacturing factory overhead. One way to try to make sense of this component is to break out the factory manufacturing overhead into three additional sub components. One sub component would be indirect materials, another one would be indirect labor, and the third one would be, what I call, the other manufacturing overhead category. Before we get into the specifics (詳細), let’s look at some of the components or some of the items that make up manufacturing overhead. They are not traceable to the product, in this case the product again the manufacturing is a table. So if manufacturing overhead cost cannot directly be traced to the table. 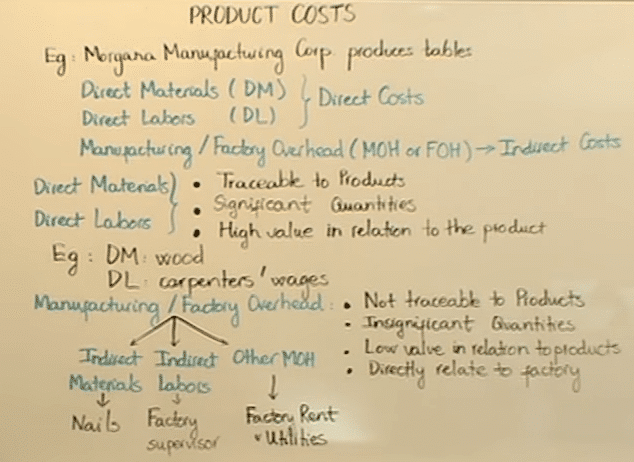 Next the manufacturing overhead cost is in insignificant quantities, third the value of a manufacturing overhead item taken by itself may be relatively small or low in relation to the overall product cost. And finally every manufacturing overhead item is directly related to the factory. Please keep these points in mind as we looked into some of the specific components that make up the manufacturing factory overhead. So let’s go back to the little diagram (図) here, one component of manufacturing overhead is indirect materials. Going back to the example. I have used the example of nails. So let’s assume that you need a couple of nails to hold your wood together to mix up your table. The nails, the cost of the nails is small in relation to the overall table cost and so from an accounting standpoint is not cost effective to keep a track of what it cost us 10 nails or 12 nails that go into the table. So although the nails go directly to the table, from a cost standpoint we try to avoid costing those twelve or fourteen nails that were used. Instead it will cost the nail by the barrel as we buy them rather than on an individual nail basis. Indirect labor, an example of indirect labor that I have shown you is a factory supervisor. So let’s visualize the production floor of Morgana manufacturing, you have 15 or 20 carpenters out there every one of them making tables and you have one supervisor supervising these 15 or 20 carpenters. The supervisor is not making the tables directly himself or herself. What are the supervisor do? Typically he or she will be walking around the shop floor supervising and monitoring his or her employees. Additionally the supervisor may be engaged in administrative task as well as some other supervisory responsibilities. So the supervisor salary cannot be directly traced to a specific table, the way we can trace a carpenter’s wages to a specific table. So in factory supervisors salary is considered to be indirect labor which in term is part of your manufacturing overhead cost. Then under the other manufacturing overhead category some example here will be factory rent, factory utilities, tax on your factory, depreciation on your factory equipment etc. So the common denominator (共通項) here would all these costs are factory related. So this gives you a larger picture of what makes a product cost as well as that some of the details that make up the individual product costs.